Palisades Toys is a multi-talented bunch of folks. They produce not only great action figures, truly amazing play sets, and excellent PVC's - they also create some of the finest busts and statues on the market. 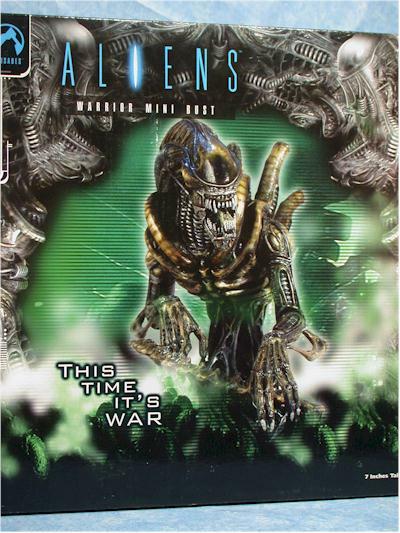 One of their more popular licenses is the Alien and Predator lines. 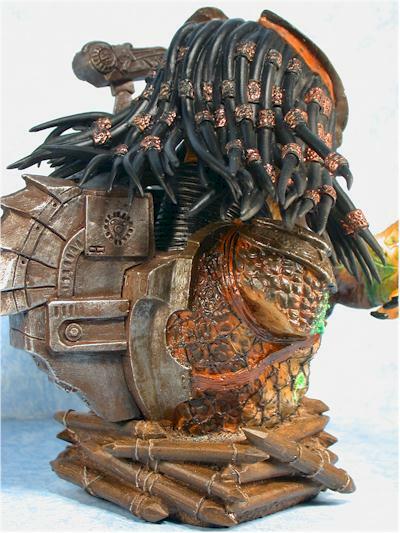 They've released two more busts in the series - Warrior Alien and Defeated Predator. With things heating up for next year's Aliens vs. Predator film, I'm betting these busts get more and more popular. These two seem slightly bigger and heftier than the previous releases, but the price tag is about the same - around $50 each. 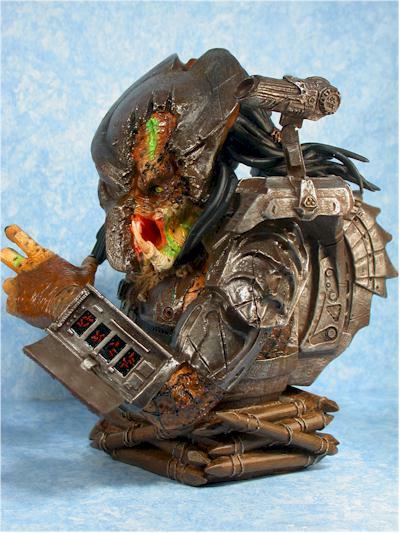 The series is going to continue with the Elder Predator and Special Edition Predator due in early 2004. The box art is solid, with a nice use of old and new graphics and photos of the bust itself. The box and foam also keep the busts very safe, but I'm disappointed that they lack the cool windows that allow you to see what you're actually getting. Hootchie Momma! I've liked the whole Alien and Predator lines, even the less popular chest burster. But these two really take the series to a new level. These are truly art, and while it's pop art, it's just as fine as a lot of the stuff in the Louvre today. How can I possibly say that? The only thing these busts have going against them is the mass production factor. Otherwise, the intent of much of the sculpture in major museums - at least early sculpture - is the same. Look at most of the busts, and you'll realize they are of King Tootenpoopen of the 3rd Dynasty, commissioned by him for the masses to show off what a pop star he really was (or at least thought he was). Is this really all that different? In your own little museum world, these two will have an honored place. The detail and sculpting is really amazing, especially on the Warrior Alien. You might not be able to convince your stuffy friends that these are art, but you'll know the truth. Both busts sport detailed, high quality paint applications. Even with a fairly small pallette of pretty basic colors, they manage to bring out and highlight the small detail and differing materials. While both are again extremely nice in this category, I prefer the Warrior Alien. The stripes on the 'collar bones' around his throat look terrific, and the use of a high gloss there instead of the flatter gloss paint used on the rest of the body adds another dimension of realism and gives these areas a turtle shell appearance that looks great. 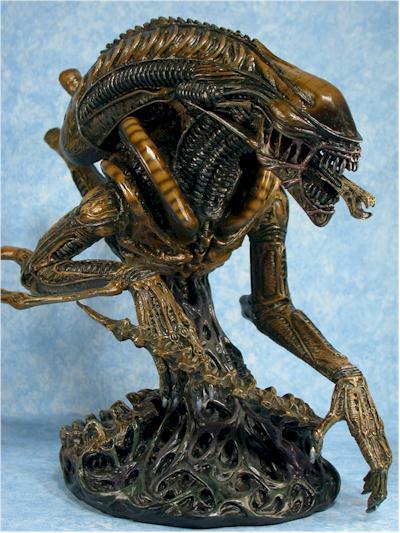 Once again, both busts do well in this category, but I like the overall design of the Alien slightly better. Even though I don't ever remember one of the Predator's wearing the damaged mask quite like this, it looks fairly good and certainly appropriate. But it's not quite as eye catching as the superb action pose they've given the Alien. With the inner mouth extended and the hands ready to strike, you see your inevitable fate standing before you. 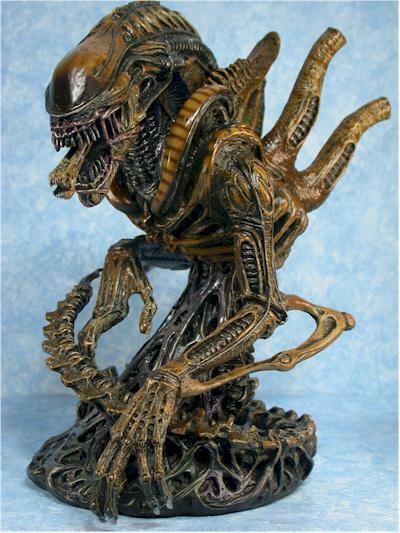 This is one of the best looking versions of the Alien I have on my shelf, and I have a lot of them. Fifty bucks is a pretty hefty price, I know. Lots of collectors who buy $10 action figures simply can't find any justification to spend four or five times that for something like this. 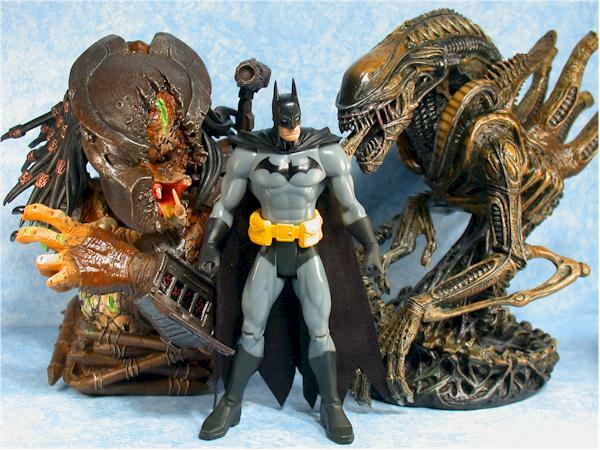 But for the bust collector, and the big Alien/Predator fan, these are a centerpiece item for their collection. These aren't a Big Lots sort of value, but they are priced at about the norm for sculptures of this style and size. After so few four star busts this year, I've gone nuts this last week! But there's no denying the exceptional work and quality of the Warrior Alien, and while the Defeated Predator isn't my favorite of the set, it's still an excellent piece of work. - Aisle Sniper has the Alien available for $45, and the Predator for $50. They also have pre-orders up for the next two, and more importantly, they have their own special exclusive of the Special Edition Alien! It's pricey, but consider this - it's cast in metal, not resin, comes in a hard wood storage box, has three different interchangeable clear domes, and is limited to only 500. It's sure to be the holy grail of this series of busts! 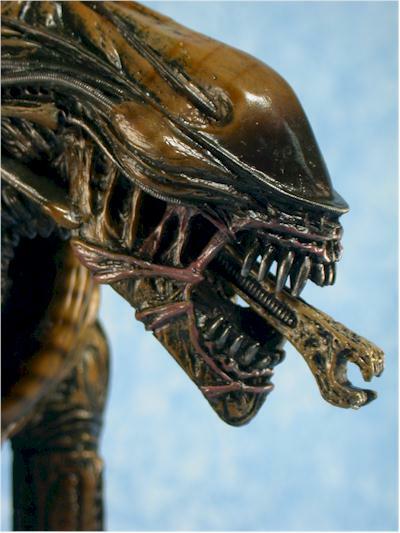 - Killer Toys has the Alien for $45, and they also have some of the new 'micro' busts available. These are smaller versions of the busts available at much lower prices.